A 5-year-old girl presented to our institute with dyspnoea (NYHA class IV), hepatomegaly, and ascites. She did not have any marfanoid features. The chest radiography showed a cardiothoracic ratio of 0.8, left atrial and LV enlargement with dilated pulmonary trunk. Electrocardiogram demonstrated biventricular ventricular hypertrophy and biatrial dilatation. 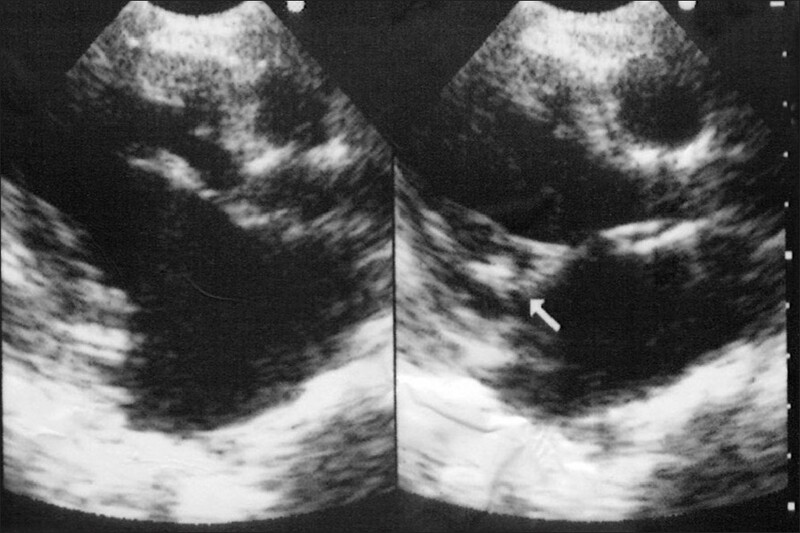 Transthoracic echocardiography revealed severe mitral regurgitation [Figure 1] and [Figure 2] due to noncoapting leaflets and severe tricuspid regurgitation with severe LV dysfunction (ejection fraction-30%). The valve leaflets were not myxomatous and there was no leaflet prolapse. She was first diagnosed as having severe mitral regurgitation at nine months of age; however, her LV function was preserved at that time. Her functional class and LV function gradually deteriorated since then. During surgery the mitral valve annulus was found to be grossly dilated with normal leaflets and subvalvular apparatus. Mitral valve repair was performed using 26 mm Carpentier-Edward classic mitral annuloplasty ring (Edwards Lifesciences, Irvine, CA, USA) based on the size of her anterior mitral leaflet. Tricuspid repair was performed using modified De Vega's annuloplasty. 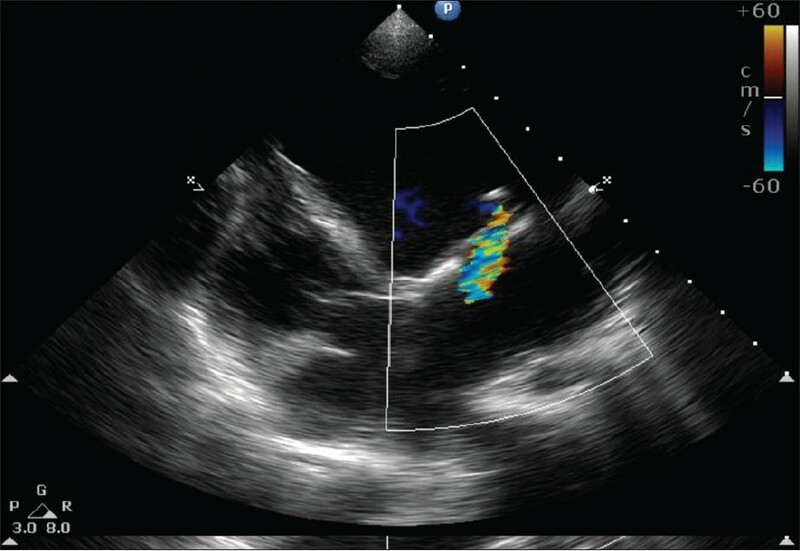 Postrepair transesophageal echocardiography revealed trivial mitral regurgitation and trivial tricuspid regurgitation. She was transferred out of the intensive care unit on eighth postoperative day and discharged after 16 days of surgery. 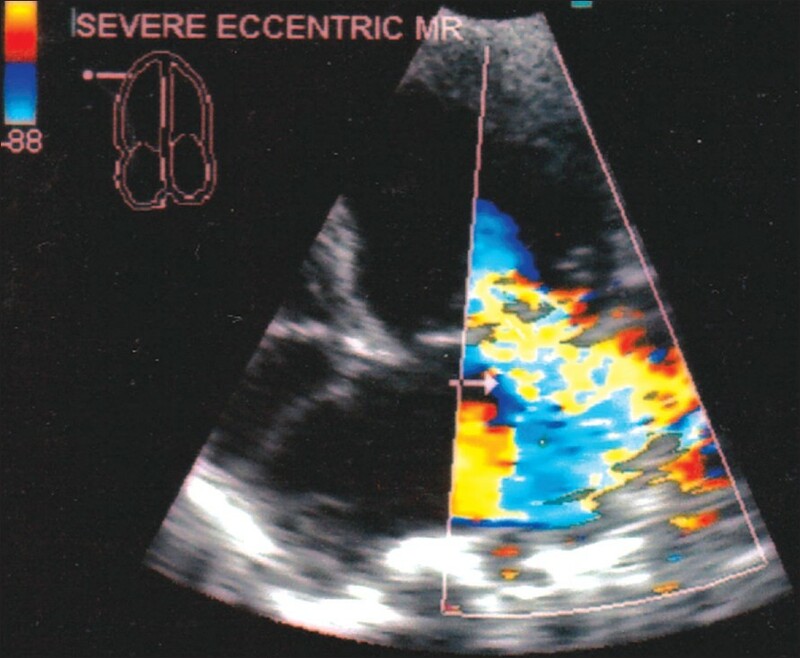 She is doing well 1 year postrepair, with echocardigraphy [Figure 3] showing mild mitral regurgitation and mild tricuspid regurgitation with a sustained LV function of 30% (NYHA class I) with improved symptomatic status. Carpentier and colleagues  reported isolated annular dilatation in 8 (17%) of 47 cases with congenital mitral valve disease; however, some deficiencies of commissural tissue were implicated by their description. Four of these patients had asymmetrical dilatation of the annulus involving only the posterior leaflet and commissural area. This form of annular dilatation is commonly seen with ventricular dilatation. Four patients had symmetrical dilatation hinting toward its primary nature. Chauvaud et al. reported congenital mitral regurgitation in 145 patients. They described annular dilatation in seven (4.8%) patients with normal leaflet motion. The dilatation mainly affected the posterior annulus and was associated with minor anomalies such as imperforate interchordal spaces. Uva et al. described ten patients with congenital mitral regurgitation. Annular dilatation was a constant feature in all patients but isolated annular dilatation was seen in only three patients. Coles et al. reported their experience with surgical management of congenital mitral valve disease. They described 22 patients with congenital mitral regurgitation. Sixteen had annular dilatation of which seven were isolated annular dilatations. McCarty et al. reported their 10-year experience of surgical management in congenital mitral valve disease. Thirteen patients had congenital mitral regurgitation, all of them due to annular dilatation but none of them was isolated. There was either a primary leaflet pathology or LV dilatation. Oppido et al. described 60 patients with predominant congenital mitral regurgitation, of which 24 patients had nondysplastic and normal leaflets with annular dilatation. However, annular dilatation in these patients was secondary to LV dilatation due volume overloading by a large left to right shunt. Thus, there were no cases of isolated annular dilatation in their series. Our case underscores the importance of recognizing isolated idiopathic annular dilatation as a cause of congenital mitral regurgitation. 1. Davachi F, Moller JH, Edwaed JE. Diseases of the mitral valve in infancy. Circulation 1971;43:565-79. 2. Carpentier A, Branchini B, Cour JC, Asfaou E, Villani M, Deloche A, et al. Congenital malformations of the mitral valve in children. Pathology and surgical treatment. J Thorac Cardiovasc Surg 1976;72:854-66. 3. Stellin G, Padalino MA, Vida VL, Boccuzzo G, Orrù E, Biffanti R, et al. Surgical repair of congenital mitral valve malformations in infancy and childhood: A single center 36 year experience. J Thorac Cardiovasc Surg 2010;140:1238-44. 4. Chauvaud S, Fuzellier JF, Houel R, Berrebi A, Mihaileanu S, Carpentier A. Reconstructive surgery in congenital mitral valve insufficiency (Carpentier's techniques): Long-term results. J Thorac Cardiovasc Surg 1998;115:84-93; discussion 92-3. 5. Prifti E, Vanini V, Bonacchi M, Frati G, Bernabei M, Giunti G, et al. Repair of Congenital Malformations of the Mitral Valve: Early and midterm results. Ann Thorac Surg 2002;73:614-21. 6. Oppido G, Davies B, McMullan DM, Cochrane AD, Cheung MM, d'Udekem Y, et al. Surgical treatment of congenital mitral valve disease: Midterm results of a repair-oriented policy. J Thorac Cardiovasc Surg 2008;135:1313-21; discussion 1320-1. 7. Uva MS, Galletti L, Gayet FL, Piot D, Serraf A, Bruniaux J, et al. Surgery for congenital mitral valve disease in the first year of life. J Thorac Cardiovasc Surg 1995;109:164-76; discussion 174-6. 8. Coles JG, Williams WG, Watanabe T, Duncan KF, Sherret H, Dasmahapatra HK, et al. Surgical experience with reparative techniques in patients with congenital mitral valvular anomalies. Circulation 1987;76:III117-2. 9. McCarthy JF, Neligan MC, Wood AE. Ten year's experience of an aggressive reparative approach to congenital mitral valve anomalies. Eur J Cardiovasc Surg 1996;10:534-39.